NASA's Opportunity rover today breaks the "longevity record" for operating on the surface of Mars, passing the six years and 116 days set by the agency's Viking 1 Lander. Opportunity arrived on the Red Planet on 24 January 2004. Its twin Spirit arrived three weeks earlier, but has been silent since 22 March this year after getting permanently bogged down in a sand trap. If Spirit does survive the Martian winter and get back in touch with base, it will in due course also pass the Viking 1 milestone. However, given the less than favourable orientation of its solar arrays since it came to a grinding halt, its future is doubtful. Previous record holder Viking 1 travelled to Mars with two orbiters and a fellow lander, and touched down on 20 July 20, 1976. It operated until 13 November, 1982, "more than two years longer than its twin lander or either of the Viking orbiters". Mars Exploration Rover project manager John Callas said: "Opportunity, and likely Spirit, surpassing the Viking Lander 1 longevity record is truly remarkable, considering these rovers were designed for only a 90-day mission on the surface of Mars." Opportunity will not be resting on its laurels. The winter solstice at its southern hemisphere location passed on 13 May, and the "gradual increase in available sunshine will eventually improve the rate of Opportunity's progress across a vast plain toward its long-term destination, the Endeavour Crater". NASA explains: "This month, some of Opportunity's drives have been planned to end at an energy-favorable tilt on the northern face of small Martian plain surface ripples [see pic*]. The positioning sacrifices some distance to regain energy sooner for the next drive. Opportunity's cameras can see a portion of the rim of Endeavour on the horizon, approximately eight miles away, across the plain's ripples of windblown sand." 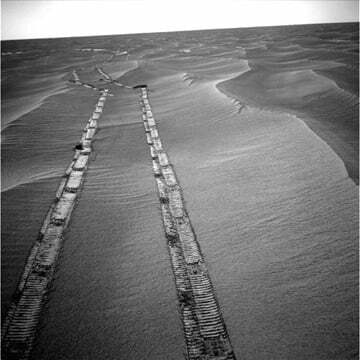 * NASA elaborates: "NASA's Mars Exploration Rover Opportunity used its navigation camera for this northward view of tracks the rover left on a drive from one energy-favorable position on the northern end of a sand ripple to another. The rover team calls this strategy hopping from lily pad to lily pad. "Opportunity took this image on the 2,235th Martian day, or sol, of the rover's mission on Mars (May 8, 2010). The tracks are from a 14.87-meter (49-foot) drive southward on the preceding sol. Mars' southern hemisphere was in the minimal sunshine period close to the winter solstice, which occurred May 13, 2010 (Universal Time)."